Earlier this week, I visited Chicago to do some work for a client. For two nights, I lived in the heart of Chicago, on bustling Michigan Avenue at a hotel next to the John Hancock Building. Without a doubt, Chicago is a great city. While I did not have time for sight-seeing or experiencing the city, it brought back memories from my younger days. 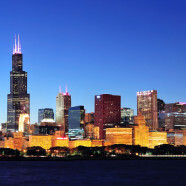 Often in college, and shortly thereafter, I traveled with friends and visited other friends living in the Windy City. The days were adventurous and the nights were long. On Sunday, the long car ride on I-94 back to Detroit awaited us. It’s not a conversation that was exclusive to my car. It is a refrain that many Detroiters have echoed over the years. I recalled those sentiments as I left town yesterday driving through a picture-perfect autumn Chicago postcard. And my thoughts were a bit different this time. No, Detroit will never be Chicago. Never has been and never will. But the idea that Detroit could have a bustling riverfront and an exciting downtown is now not just a pipe dream. I’ve spent more time in the past five years on Detroit’s RiverWalk than I ever did before. Downtown has its moments where it has a distinct, vibrant personality. Most importantly, there are true rays of hope that many of the reasons that drew us to Chicago in my younger years are already – or soon will be – on display in Detroit. Headlights PR & Marketing serves its clients by offering customized, personalized service to meet their needs and budgets. In addition to providing PR and Marketing solutions, we also provide printing and mailing services to our clients. From logos to crisis communication, from brochures to websites, from printing yard signs to providing addresses for direct mail services, from press releases to planning events, Headlights PR and Marketing looks to serve your needs. We’re a small company, proud of our Motor City roots, that serves small companies, non-profits and schools to meet their marketing and public relations needs. ©2014 Headlights PR | All Rights Reserved.